There’s a joke somewhere on the internet about how you can use your cat to tell how cold it is. At some point around freezing the cat gets friendly enough to let you pet him, below freezing he’ll actually cuddle with you, and at some point near zero the cat tears open your midsection while you sleep and warms himself in your viscera a la Luke on Hoth. That’s not quite how it works in our house. We can generally tell if it is cold out by how many animals are willing to get in bed with us. The dachshunds are always willing. They’re burrowing dogs by nature and can be found under a fleece blanket and in a sunbeam in the middle of July. They’re no useful indicator at all. It’s the cats who are useful. The most helpful aspect of the cat personalities is that they don’t get along terribly well. It isn’t that they don’t like each other, it’s that Bucky is the Elderstateskitty and Lord of the Manor and that Scratch wishes he was. Every so often Scratch tries to usurp the title and each and every time Bucky puts him firmly back in his place. So you know it is cold out when Bucky and Scratch are doing this. 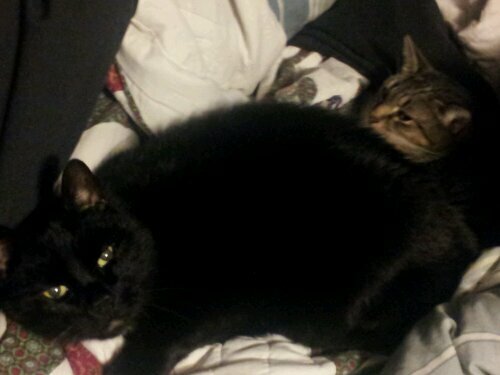 That’s the two of them actually cuddling on our bed. They’re touching one another without teeth or claws involved. This is as sure an indicator of cold temperatures as a #polarvortex tag or a Ned Stark meme. Granted, they didn’t cuddle together for long. Scratch is back to sitting on his favorite heating vent and Bucky is asleep on the bed by himself. Maybe that means it is warming up?